There’s something fun about making beer can burgers. The moulding of the burger mixture around a beer can remind me of a craft project. Then you wrap it in bacon and stuff it with whatever your heart desires. It is very hands on. Originally the beer can burgers were destined to be barbequed. Unfortunately the weather had other ideas and the result was baked beer can burgers. Not much fun having a BBQ in the pouring rain. You could say that these baked beer can burgers have an Aussie influence. I couldn’t resist adding egg and pineapple. A generous wrap of bacon around the outside completed the picture. All that was missing was beetroot, but that is easily added to the side salad. Or add some beetroot to the burger if you are putting them in buns. 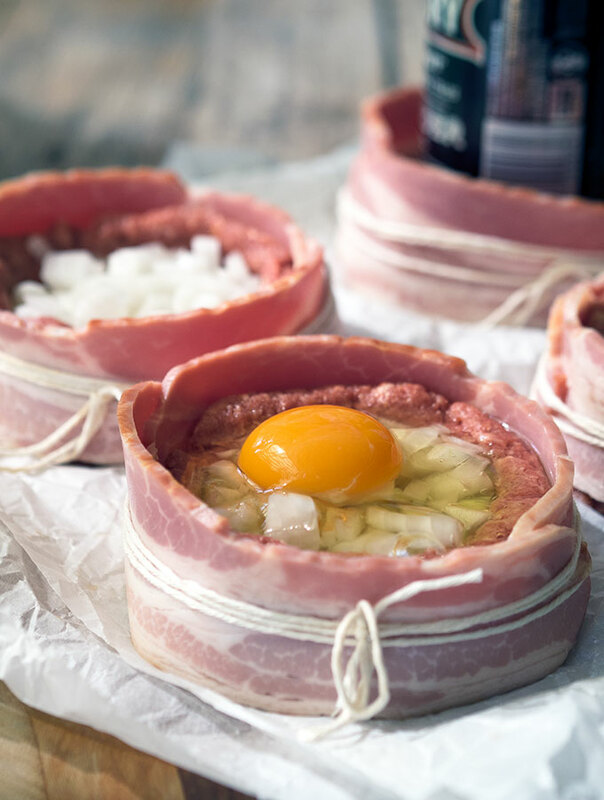 Baked Beer Can Burgers, stuffed with onion, pineapple and egg then wrapped in bacon. 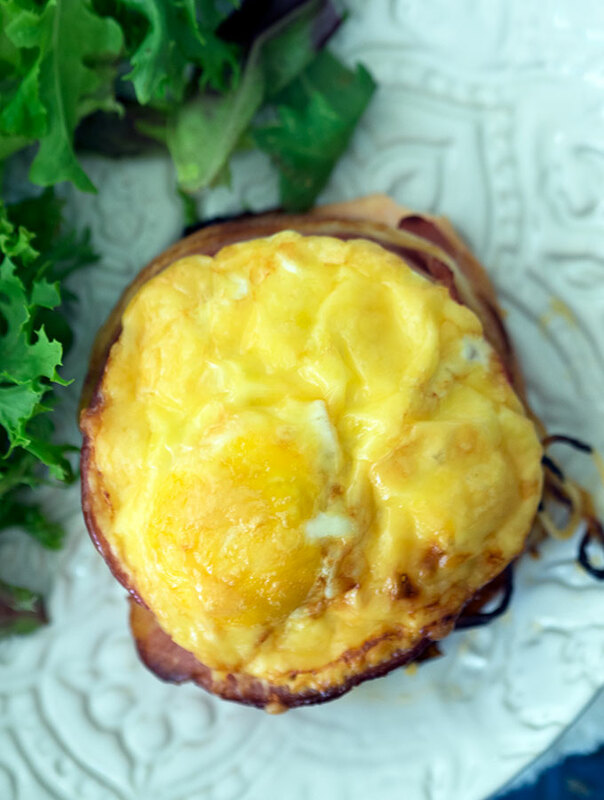 Simply delicious, serve with salad or on a bun. Pre-heat oven 180°C (360°F) and line a baking tray with baking paper. In a large bowl place beef mince, breadcrumbs, egg, sauces and a pinch of salt. Mix ingredients until completely combined. I find using clean hands is the best way to do this (or wear disposable gloves). Divide burger mixture into 4 even round portions. With one portion of burger mixture, flatten slightly and then squish the beer can into the mixture. Mould the burger mixture around and about 7cm (2 inches) up the side of the can. Wrap a slice of can around the burger and secure with some kitchen string. Remove can. Repeat with the remaining 3 portions of burger mixture. Sprinkle onion in the cavity of each burger, followed by a slice of pineapple. 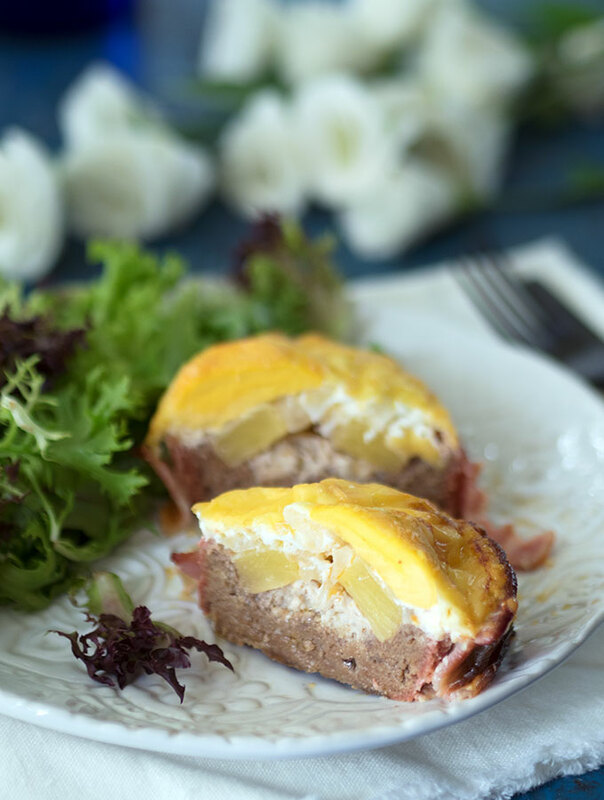 Break an egg on top of the pineapple slice and then top with grated cheese. Place burgers in the oven and bake for 30 minutes or until cooked through. 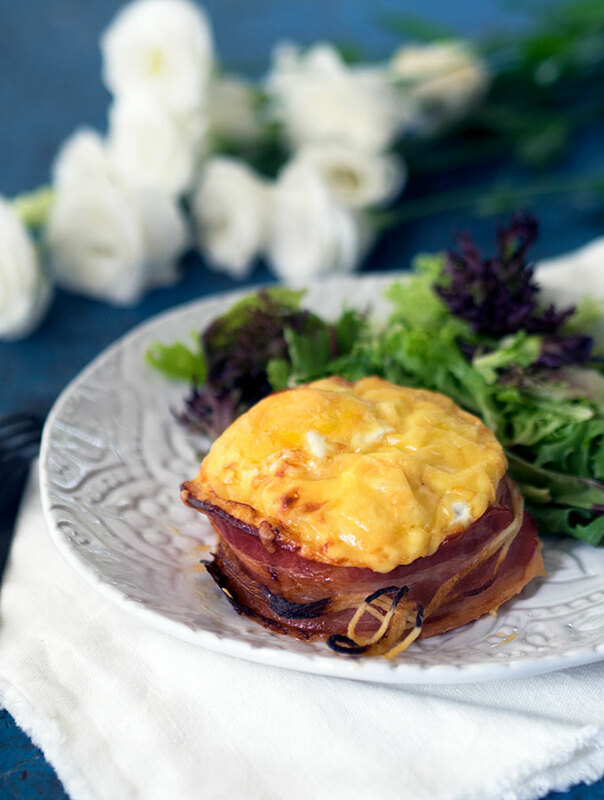 Serve with salad or on a burger bun. Alternatively burgers can be cooked on a BBQ with a hood. Place burgers on a heated solid BBQ plate, under low heat. Cook for approximately 5-10 minutes and then close hood of BBQ to finish cooking until cooked through. What you stuff your baked beer can burgers is only limited by your imagination. Think mushrooms, feta, fresh herbs, olives, tomato, and various other vegetables. It’s endless with what you can stuff them with. Spice up the burger mixture with a touch of curry powder or other dried ground spice. I have kept them relatively simple, but sky’s the limit! 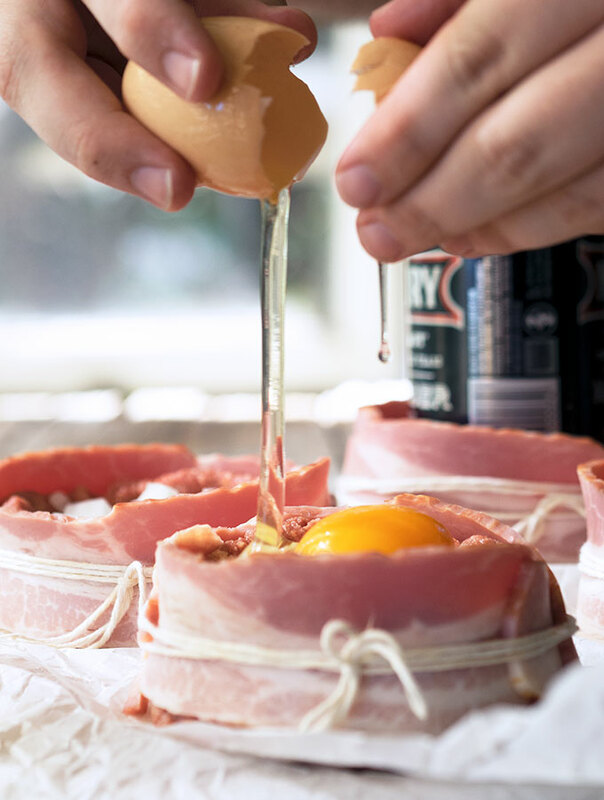 What would you stuff your baked beer can burgers with? Tempted for another burger recipe? Why not try our Lazy Piglet Burgers. Wow! We’re are definitely having this weekend. I have never imagined burgers can be made this way. It is like the Lord of all burgers. Thank you for sharing this recipe. I know everyone would be delighted to try. Shut the front door… this is AMAZING. And I am with Amanda, totes making for breakfast on the weekend. YUM! This is so creative, I love it. Looks absolutely delicious! I have never seen anything like this. You had me at bacon really. A really innovative recipe, I am sure people would go crazy for this one. Wow…This would also make a great breakfast with a side of hash browns! Great flavor combination. Love that photo of the egg cracking! This sound so good! Great for Father’s Day or just for any weekend! Well hello there! OMG Sara these look and sound insanely good! Beats the ordinary pancakes I had for breakfast today. And go the pineapple!